It’s Romo’s first tweet since his injury, it’s a clip from Major League, and it implies Romo’s belief/hope/optimism that the Cowboy, at 2-7, can run off a string of wins and make the postseason. 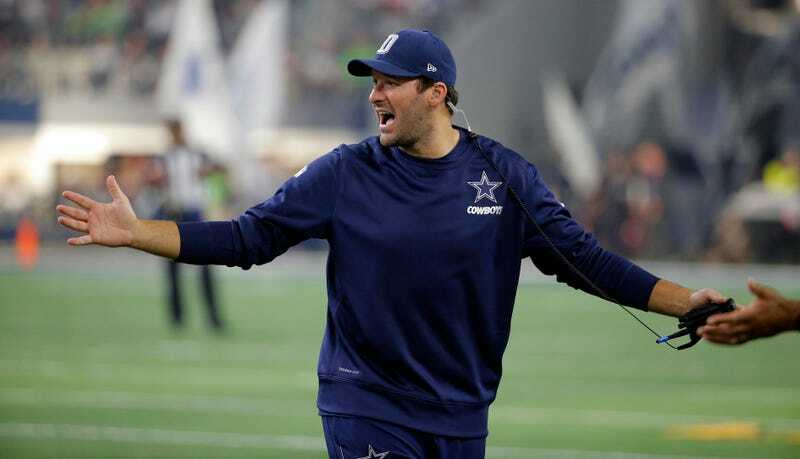 And hell, more than that: Romo’s spent the year predicting a Super Bowl. Romo will start on Sunday in Miami, the first game he’s eligible after going on IR with a broken collarbone, and it should change the Cowboys’ fortunes somewhat. Weeden and Cassel have been bad—but not horrifically so—combining for six touchdowns and seven INTs in their seven-plus games manning the offense. But it took a lot of things to go wrong, plus plenty of bad luck, to go 0-7. Though they’ve been in just about every game, they can’t hold leads, and they’ve failed to score touchdowns in three separate games. Both the offense and defense are just OK—with Romo, the offense should return to above average. That’ll be enough to improve their record, but enough for a playoff berth? This is the division for it. Dallas is just two-and-a-half back of the Giants, and because their only two wins came in the division, the potential tiebreakers are still up in the air. Though no 2-7 team has ever made the playoffs before, eight wins could be enough to take the NFC East. A great team could feasibly go 6-1 with this remaining schedule, but the Cowboys’ woes, even accounting for quarterback play, have shown they aren’t great. They might be good, but even with a healthy Tony Romo they’re probably not quite good enough to climb out of the hole they’ve dug. And honestly, if the universe wanted to tell a feel-good story like Major League, it’d make the Cowboys go 0-14 to finish their season.